Lotus Blossom Tank KAL: It is finally done! Just beautiful! I actually have only worn mine once! Hopefully we'll have a nice hot summer. Very nicely done- I'd love to see it on her, but I'm sure she's thrilled. 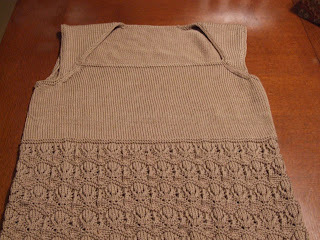 I wonder how the tank would look over a thin white cotton lacy blouse. Just in case it's cooler this summer...I like that color a lot.